A rendering of the Farmdale station. Source: Expo Line Construction Authority. A new Expo Line station for Farmdale Avenue that is adjacent to Dorsey High School was unanimously approved by the California Public Utilties Commission on Thursday, paving the way for completion of the first phase of the project between downtown Los Angeles and Culver City. A new map of the Expo Line showing the location of the Farmdale station. Click above to see a larger image. 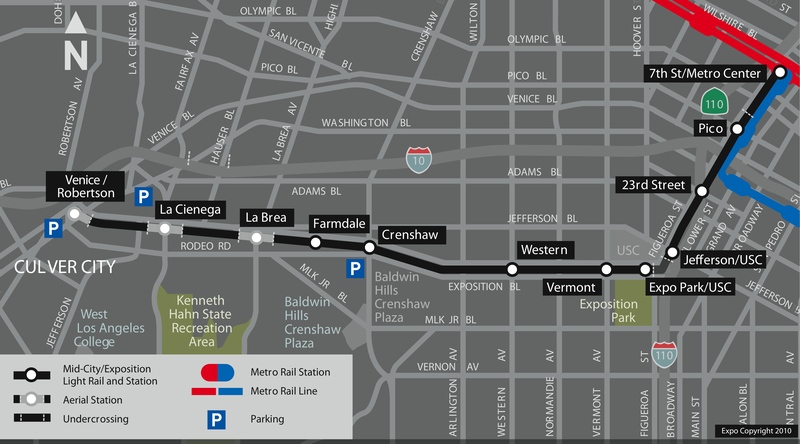 It is expected that the line will first partially open as soon as next year, before finally reaching Culver City. The PUC approval puts to rest a long-running dispute over how the Expo Line navigates the Dorsey High area. Original plans did not call for a stop at Farmdale. But the Los Angeles Unified School District and some members of the community protested that a street-running line next to the school could pose a danger to students. Several alternatives were looked at — such as a pedestrian bridge over the tracks and a bridge for the train over the street — and ultimately rejected in favor of adding a station. The station configuration, shown above, ensures that all trains will have to stop before crossing Farmdale. In a related move, the Board of Directors of Metro last week approved spending the $18 million needed to build the new station. Here’s a link to the proposed decision on Farmdale that was issued by an administrative law judge in June. The vote today was to accept that proposed decision. The press release from the Expo Line Construction Authority — the agency building the line — is after the jump. Metro will the operate the line once it’s completed. Los Angeles, CA (July 29, 2010) – The California Public Utilities Commission issued its final decision today unanimously approving the settlement agreement between the Exposition Construction Authority (Expo), the Los Angeles County Metropolitan Transportation Authority and the Los Angeles Unified School District that provides for a station at Farmdale Avenue in the Mid-Corridor segment of the Expo Line project. 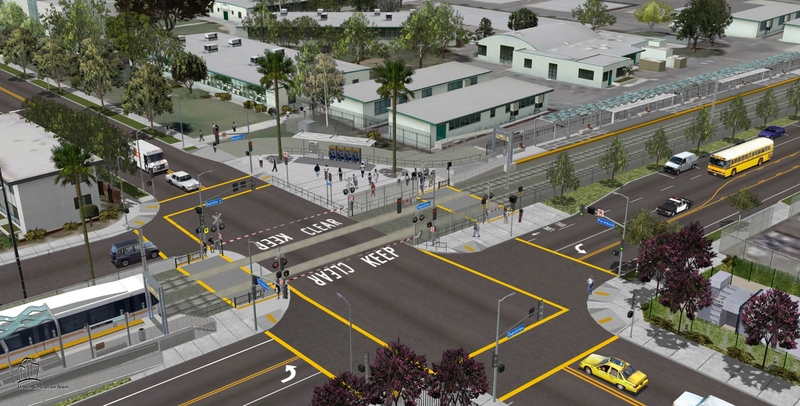 As a result of the CPUC’s approval, a light rail station will be built adjacent to Susan Miller Dorsey (Dorsey) High School that will include at-grade vehicular and pedestrian crossings with extensive safety enhancements. The new neighborhood station at Farmdale Avenue will allow for increased mobility of local residents and Dorsey High School staff and students, and will provide convenient access to employment and activity centers. The train would make a complete stop at the Farmdale Avenue station to pick up and drop off passengers. The crossing would include traffic signals and additional street lighting, as well as state-of-the-art safety improvements such as quad gates, pedestrian gates and LED train approaching signs. The crossing would also feature automatic train control that limits the train to 15 miles per hour while in the crossing. In addition, a parking lot will be built for Dorsey High School staff at the corner of Farmdale Avenue and Exposition Boulevard. The Expo Line is a new light rail line that will travel along the I-10 Freeway corridor between Downtown Los Angeles and Santa Monica. Once completed, it is expected to attract a ridership of approximately 64,000 per day. With the ability to carry residents between downtown Los Angeles and Santa Monica in under 50 minutes – even during rush hour – the Expo Line will improve transportation mobility for residents and commuters along the corridor, and provide enhanced access to employment and activity centers, including downtown Los Angeles, Culver City, Santa Monica and other destinations along the corridor.